Frederick Cecil Donald and Mary Yeomans Donald, Westmount, Quebec; By descent to their daughter, Oakland, California. The oil on canvas derived from "The Blue Sleigh" has been in the collection of the Tom Thomson Memorial Art Gallery since 1974. - Frederick Cecil Donald et Mary Yeomans Donald, Westmount, Québec; Par déscendance à leur fille, Oakland, Californie. 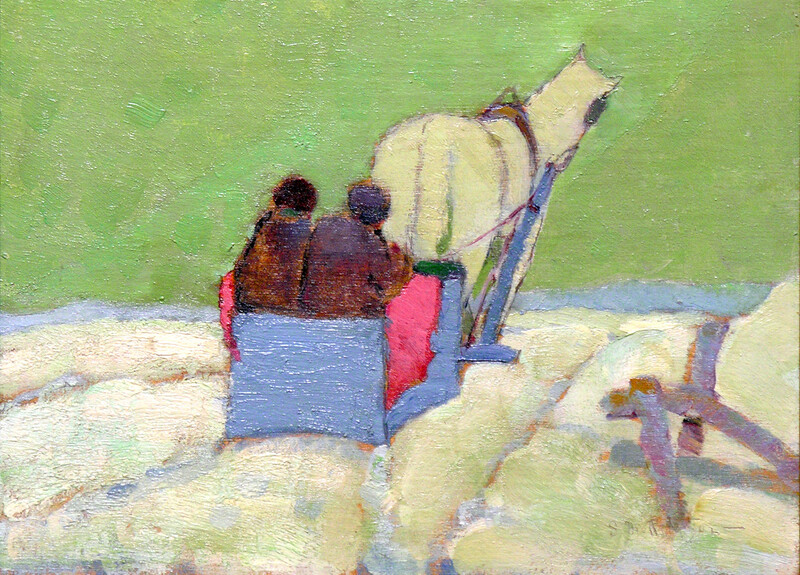 The oil on canvas derived from "The Blue Sleigh" was exhibited at: British Empire Exhibition, Wembley 1924, no. 204; Royal Canadian Academy Exhibition 1925, no. 188; National Gallery of Canada Exhibition 1926, no. 141; Canadian National Exhibition 1926, no. 219; Quebec 1927, nn; Group of Seven Exhibition 1928, Art Gallery of Toronto, no. 89; Buffalo 1928, no. 45, loaned by F.B.Housser; AFA (1) 1930, no. 50, loaned by Miss Norah Thomson, Toronto; National Gallery of Canada, "The Group of Seven Art for a Nation" 1995-1996, traveling exhibition also visiting the Art Gallery of Ontario, Vancouver Art Gallery and the Montreal Museum of Fine Arts. Charles C. Hill (1995), "The Group of Seven: Art for a Nation", National Gallery of Canada, Ottawa. The oil on canvas derived from "The Blue Sleigh" is Fig 195, cat. 129, illustrated on p. 228.